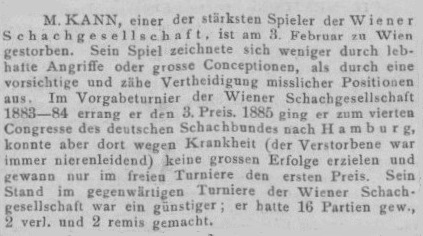 Which is the earliest published game featuring the Caro-Kann Defence? 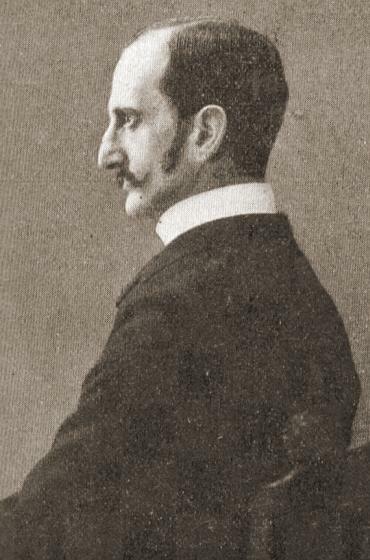 C.N. 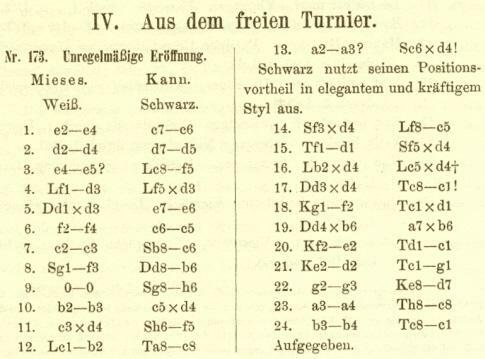 42 (see page 260 of Chess Explorations) reported on an 1864 consultation game involving Zukertort (White). We can now say that G.S. Spreckley v A. Mongrédien, Liverpool, 1847 began 1 e4 c6 2 d4 e5 3 dxe5 Qa5+ 4 Nc3 Qxe5 5 Nf3 Qc7 6 Bc4. White won by forcing mate at move 25, and the full score appeared on page 115 of the Chess Player’s Chronicle, 10 April 1847. 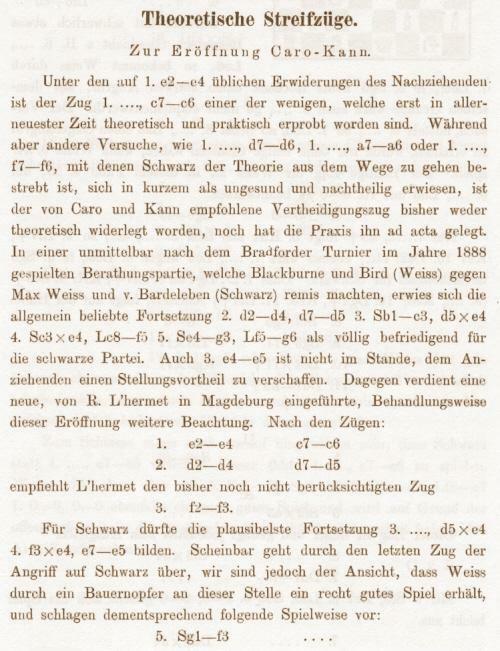 A game played in India between Valentine Green and ‘The Brahmin’ opened 1 e4 c6 2 d4 d5 3 Bd3 e6 4 Nf3 Nf6 5 e5 Nfd7 6 c3 c5 and was published on page 111 of Cassell’s Illustrated Family Paper, 16 July 1859. 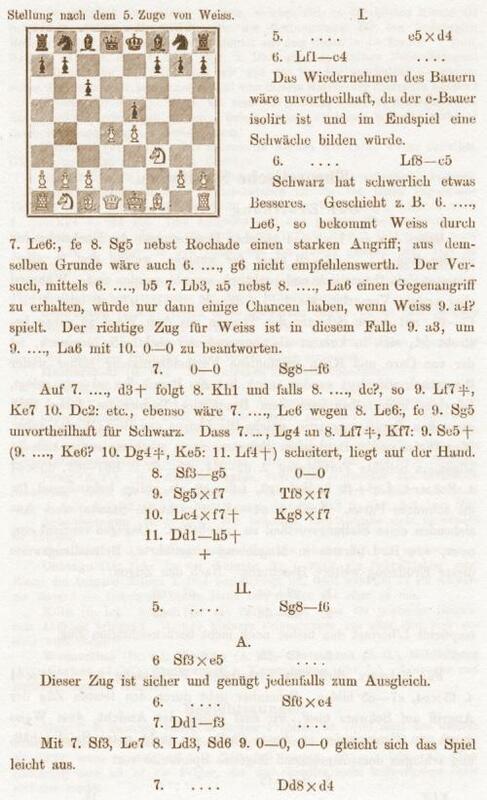 Source: Chess Player’s Chronicle, 1845, pages 336-337. The position after Black’s 5th move also arose in a simultaneous game of Fischer’s against J. Fajkus in Cicero on 20 May 1964. 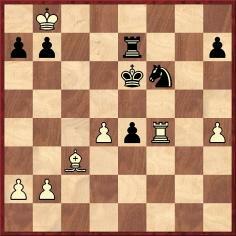 The opening moves were 1 e4 e5 2 Nc3 c6 3 d4 Qc7 4 dxe5 Qxe5 5 Nf3 Qc7. 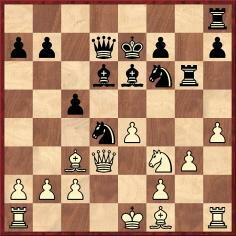 Fischer now played 6 Bd3 and scored a quick win. The present item focuses on the origins of the name ‘Caro-Kann Defence’. 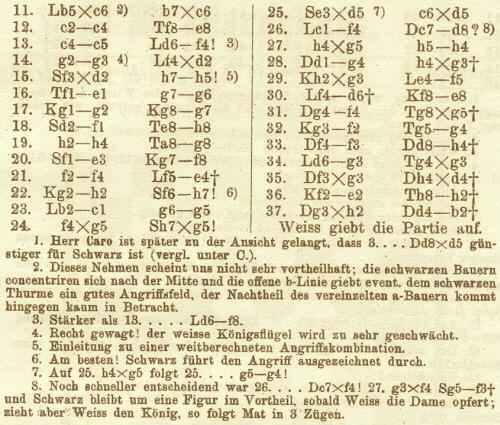 Max Weiss played 1...c6 four times at Nuremberg, 1883, but the tournament book made no attribution of the move to a particular player or analyst. 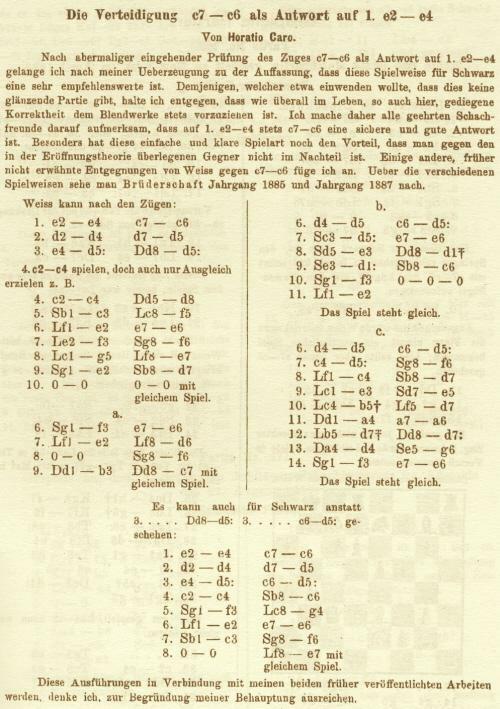 The same material in the BCM was included on pages 78-79 of the Bradford, 1888 tournament book. The reference books are not always reliable. 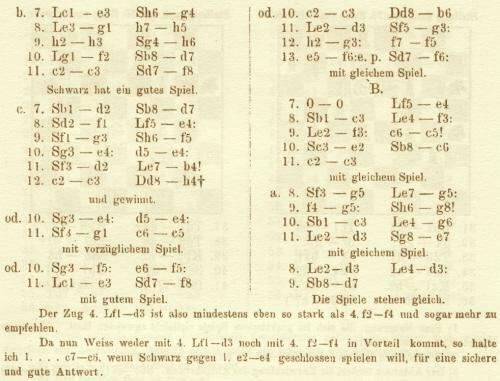 Page 57 of An illustrated Dictionary of Chess by Edward R. Brace (London, 1977) claimed that ‘the opening was named after H. Caro of Berlin and M. Kann of Vienna, both of whom played it in the 1890s’. 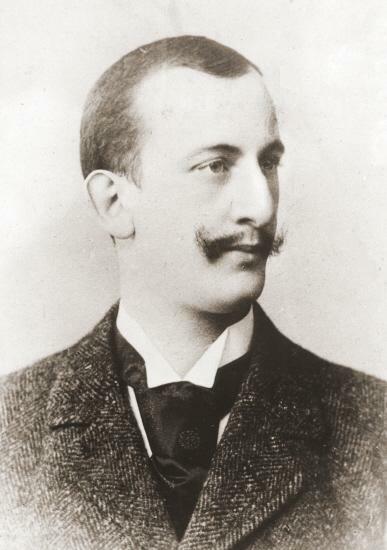 Kann died in 1886. 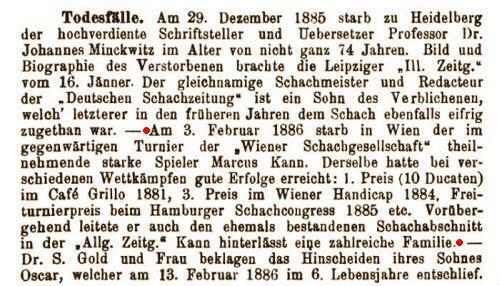 (His death was noted in two and a half lines on page 128 of the April 1886 Deutsche Schachzeitung, with no mention of 1...c6.) 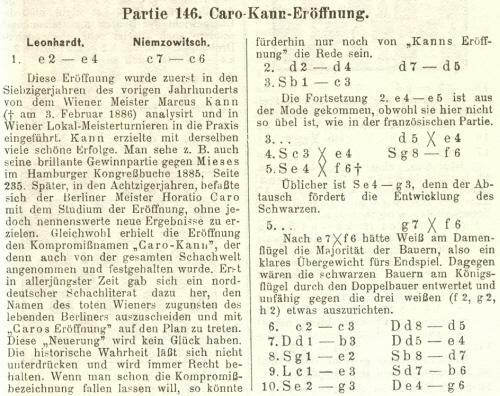 The entry on the Caro-Kann Defence in The Oxford Companion to Chess stated that the recommendations of both Caro and Kann appeared in Brüderschaft, in 1886, whereas in reality the games and analysis of Caro alone were featured in that magazine, with no mention of Kann. 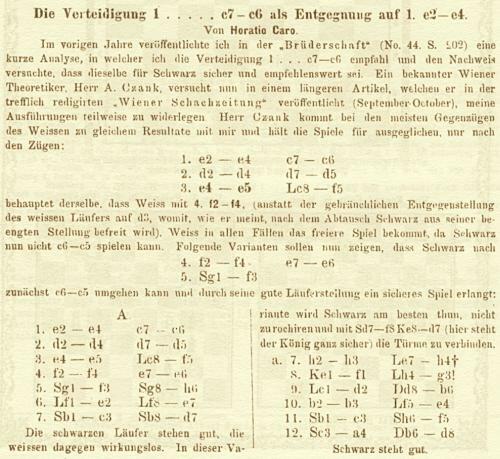 Pages 202-204 of Brüderschaft, 30 October 1886 had material by Caro in ‘Zur Theorie der Eröffnungen’. 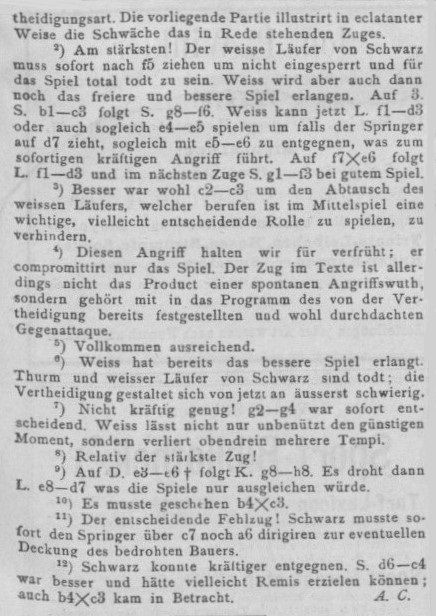 The first half of the article, reproduced below, discussed 1 e4 c6 and used the term ‘Caro’s Eröffnung’ in a game between von Bardeleben and Caro played in Berlin earlier that year. We take ‘Dr Lasker’ to be Berthold Lasker, Emanuel’s elder brother. 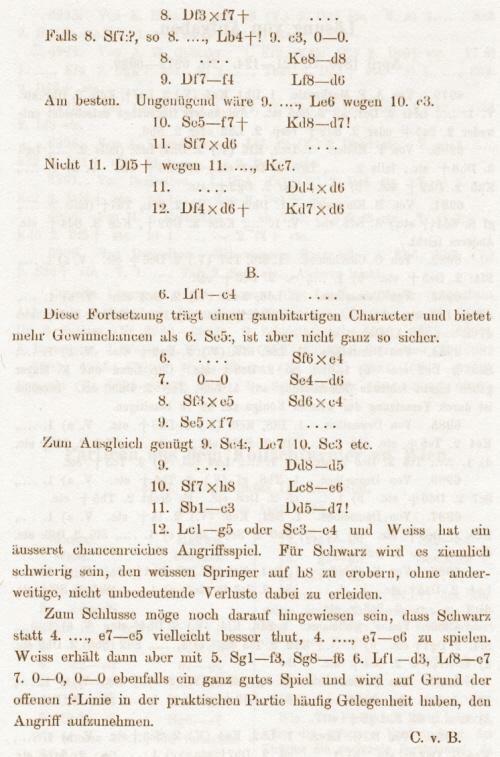 1 e4 c6 2 d4 d5 3 Nc3 dxe4 4 Nxe4 Bf5 5 Ng3 Bg6 (G. Irion and S. Tarrasch v H. Caro and M. Kürschner, Nuremberg, August 1888 – pages 372-373 of Brüderschaft, 17 November 1888). 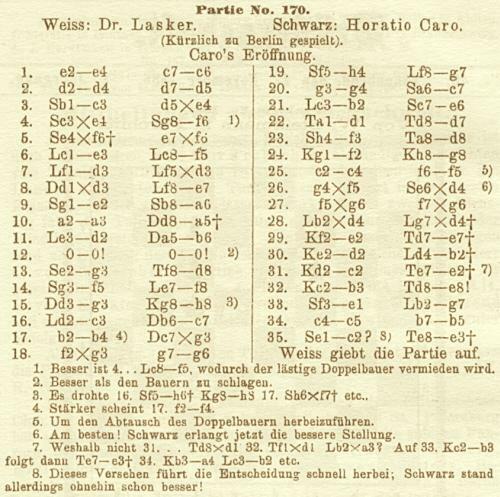 Nonetheless, even in the early years of the twentieth century the term ‘Caro-Kann’ was not always used. 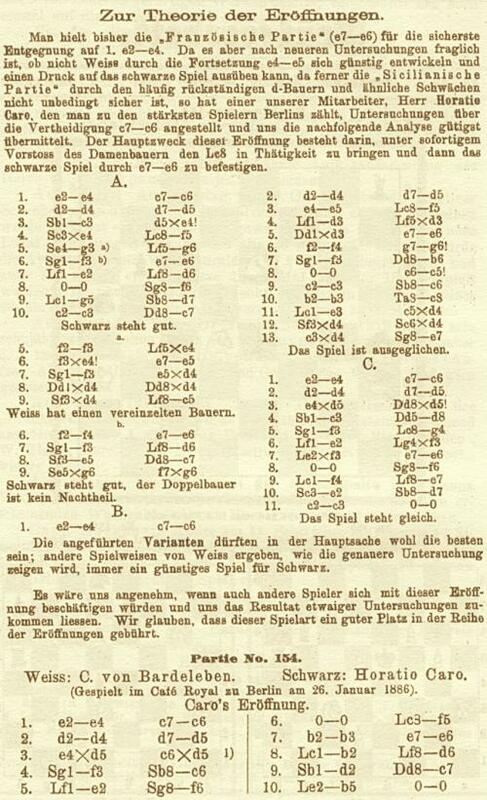 For instance, pages 357-358 of La Stratégie, 23 December 1905 gave a cable game between Davidson and Caro. In reply to 1 e4 Caro played 1...c6, but the game was headed ‘Défense Kann’. What exactly can be demonstrated about Marcus Kann’s contribution to the Caro-Kann Defence? 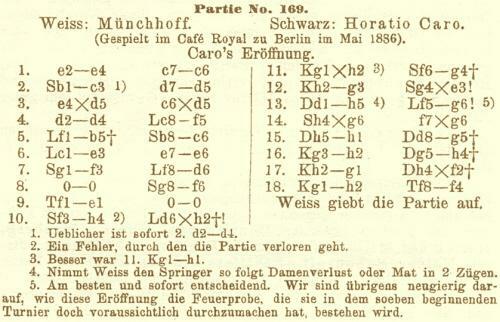 Chess Personalia by Jeremy Gaige states that Caro died in London on 15 December 1920. Information about his final years is sought. For an English version, by Robert Sherwood, see pages 339-340 of the translation published by Caissa Editions in 2007. 37...e3 38 Kxa7 Rc7 39 Rf1 Nd5 40 Kb8 Rg7 41 Re1 Kf5 42 Ba5 Ke4 43 Bd2 Kxd4 44 Rxe3 Rg8+ 45 White resigns. ‘This defense limits the possibilities of White. When the defenses P-K4, P-K3 or P-QB4 are employed, White has a much bigger choice of variations than in the case of the Caro-Kann Defense, where Black usually has a very solid position. As a result, in match-play the Caro-Kann is a very efficient weapon, since, in a match, one plays as White to win the game, whereas, as Black, one tries to merely obtain a satisfactory defense. 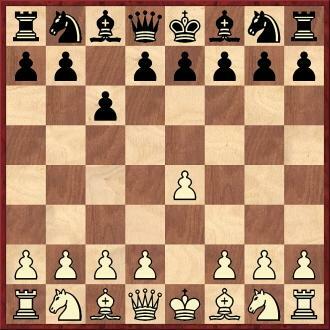 And if, in the last Tal match, White got a slight advantage against this defense, the reason was not because of the opening itself, but because of errors committed later in the game. 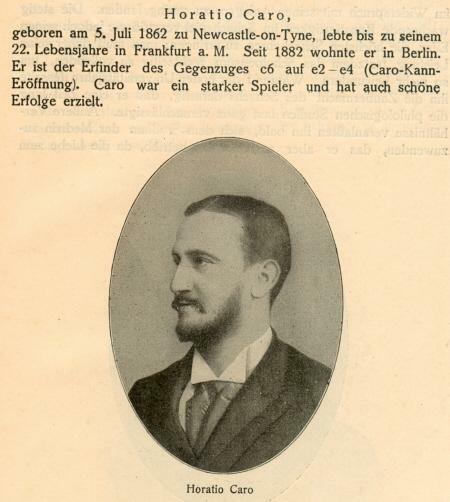 Thomas Niessen (Aachen, Germany) draws attention to an article by A. Csánk, ‘Die Vertheidigung 1...c7-c6 als Entgegnung auf 1 e2-e4’, in the Wiener Schachzeitung, 1 September 1887 (pages 49-52) and 1 October 1887 (pages 73-75). 1 e4 c6 2 d4 d5 3 exd5 cxd5 4 Bd3 Nc6 5 Ne2 e6 6 c3 Bd6 7 O-O Nf6 8 Ng3 h5 9 h3 Qc7 10 f4 Bd7 11 Be3 h4 12 Ne2 Nh5 13 Nd2 a6 14 Qc1 Rc8 15 Nf3 Qd8 16 Ne5 Nxe5 17 fxe5 Be7 18 Qe1 Bg5 19 Qf2 Bxe3 20 Qxe3 Rh6 21 Rf3 Kf8 22 Raf1 Be8 23 Nf4 Ng3 24 R1f2 Kg8 25 Ne2 Nh5 26 Kh2 Rc7 27 g4 hxg3+ 28 Nxg3 f5 29 exf6 Nxf6 30 Kg2 Rf7 31 Qg5 Rf8 32 Rf4 Qd6 33 Rh4 Rxh4 34 Qxh4 b5 35 Qg5 a5 36 h4 b4 37 h5 Nd7 38 Rxf8+ Qxf8 39 h6 Qf6 40 Qxg7+ Qxg7 41 hxg7 Kxg7 42 cxb4 axb4 43 Bb5 Nf6 44 Bxe8 Nxe8 45 Nh5+ Kg6 46 Nf4+ Kf5 47 Kf3 Nd6 48 Nd3 Nb5 49 Ke3 Nd6 50 b3 Kf6 51 Nxb4 Nf5+ 52 Kd3 Ke7 53 Nc6+ Kd6 54 Ne5 Ne7 55 a4 Kc7 56 b4 Nc8 57 Kc3 Nd6 58 b5 Nf5 59 Nc6 Nd6 60 Kb4 Nb7 61 a5 Nd6 62 Ne5 Ne4 63 Nd3 Kd6 64 a6 Kc7 65 Ka5 Nd2 66 b6+ Kb8 67 a7+ Resigns. In a separate discharge register for the South Grove Institution, an entry dated 15 December 1920 for “Caro Horatio”, an infirm adult, records simply that he is “Dead”. Both the above records can be viewed on-line. We note that the Find a Grave website has also lifted a photograph of Caro from C.N. 7249. Latest update: 31 January 2016.